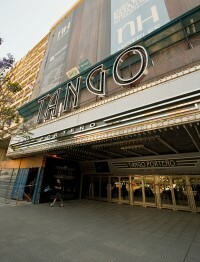 Milonga - that is the keyword to use when looking for a good way to learn Tango in Buenos Aires. Milongas are basically all-night Tango dance parties that are usually prefixed with a Tango lesson. It's been way too long since I've been to a dance studio. I'm obsessed with dancing and I haven't had my fix for about a month. Now that I'm in Buenos Aires, the Tango capital of the world, I knew that I could get into a good dance studio and learn me some Argentine Tango (which they just call "Tango" here). The Milonga that I went to was held at a dance studio called La Viruta. That place was hopping - full of locals and foreigners alike. I have been to tons of ballroom dance parties in Kentucky, Michigan, Nevada, and all over the States and they are all pretty much the same. Don't get me wrong, they're awesome, but they all have the same format and the same type of people that go to them. Mainly middle-aged to old people who like to dance a good, easy-going Foxtrot. Boo-erns. 1) There are actually young people there. This is a very strange concept to ballroom dance parties in the States. The most young people (20-30 years old) that I've seen at a ballroom dance party in the States at one time was about 10 - and that's really rare. These Milongas are PACKED with young people. Most dance studios in the States are just barely hanging in there financially. In Buenos Aires, dance studios are money-making machines. As I write this, I'm sitting in a McDonalds that's located in the "Times Square" of Buenos Aires. I'm looking out the window across the street and I see huge metal letters that spell the word TANGO. A dance studio located in a the most prime real estate in the country. Wow. ...and half of the people there speak some other language. 4) The ladies - holy crap. Yeah. To say that the young Argentinean ladies at these Milongas are beautiful would be lying. They are drop-dead gorgeous. No, seriously. I had to pinch myself to make sure I wasn't dreaming - gorgeous young ladies who actually like to dance? Yeah, they exist in the Sates too, but a whole room full of them! Dude. I even got to dance a West Coast Swing with some chick from France who didn't know the dance, but was able to follow my lead. There shall be more Milongas my friend, oh yes, more Milongas indeed. Hey Sam great information, I also dance. I have competed and preformed latin ballroom, salsa—have danced Samba, and West African. And, the best thing about dance classes are the girls out number the men. Most men don't understand this concept. I did some dancing in Egypt, and yes it was with men, it's a cultural thing, again I didn't mind, we all danced for the older ladies. I added your link in my travel blog. Hey Sam, you don't know me but I kinda stumbled on your blog. I'm a ballroom dancer myself(West Coast being one of my favs, along with salsa) and I loved this little tidbit about the Milongas. Will definately remember that when I'm on my own RTW trip. Really awesome job with this website I have to say! Sounds like too much fun. I'd kill to find something like that around here. No dice. The place my husband and I used to go to for Swing has shut down, so we're out of luck. Live it up, cousin! @Shawn: It's funny how the girls always outnumber the guys. Thanks for the link! So do you know if there´s an actual west coast swing place here in BA? Please let me know! Is there any ballroom dancing in B.A. that is not Tango-specific?